about how the quality of their newscasts would be much better if they could bring their reporters and anchors in out of the elements - but still have them on location. Their solution was to build a mobile version of their news set in the back of an old production truck that they had once used to shoot their local commercials - and Rosco VIEW and LitePads helped them make it happen. They had a smaller version of their news set built in the box area of the truck with a window behind the desk so that they could shoot out the back. As you can see, the problem with shooting out the back is that the bright exterior light blows out the background and doesn’t allow you to see the details of what’s outside. By installing Rosco VIEW in the back of the truck, the WFTV crew can now control the exposure through the window - even as lighting conditions change outside. 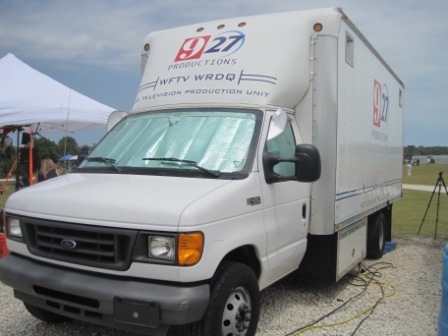 Imagine shooting inside a medium sized moving truck and you’ll have a pretty good idea of the cramped quarters of the WFTV mobile studio. In order to light it, they needed a source that would not only make the talent look good, but would also be easy on the anchors’ eyes and not generate any heat. Rosco LitePad Axioms utilize cool running LEDs and are engineered to emit a soft, glowing, pool of light rather than a retina-searing beam of light as other LED fixtures are apt to do. This makes the talent look good, while making them more comfortable at the same time. 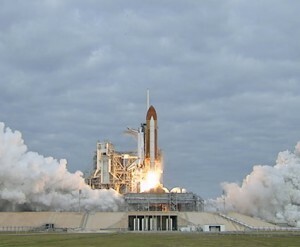 The test run for the WFTV mobile studio was the final launch of the Space Shuttle Endeavour. 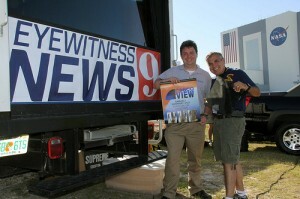 Once WFTV’s operations manager, Dave Sirak, and his crew had the Rosco VIEW and LitePads installed, they invited me to join them at Kennedy Space Center so that I could see the mobile studio and all of its Rosco components in action as they delivered their shuttle launch news coverage. I was so excited! I have wanted to see a shuttle launch since I was 11 years old and now I was also getting a chance to have a first-hand look at how a news team handles the high pressure situation of a shuttle launch…getting scrubbed! I’m not going to lie - the mission getting scrubbed with a couple of hours left on the countdown clock was disappointing, but the time I got to spend in Orlando with Dave and his crew was fantastic. 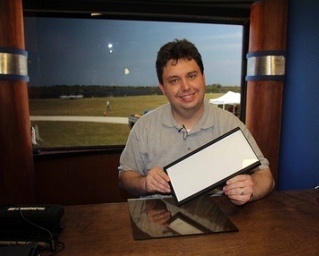 What I did get to see first-hand was how the WFTV mobile studio is a perfect example of how Rosco VIEW and LitePads can be used. Rosco VIEW enables Dave and his crew to change the exposure out the window as the lighting conditions change throughout the day. For example, the camera inside the truck was aimed due east at the countdown clock with the shuttle off in the distance, which meant that the lighting conditions were much different during the morning broadcast than they were at the midday broadcast. Rosco VIEW allowed the crew to change the exposure of the window with a quick rotation of the Rosco VIEW Camera Filter as they shot their various newscasts throughout the day. 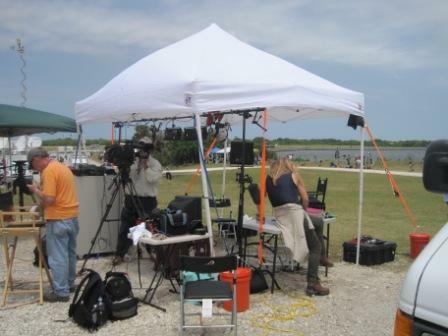 And, even though the temperature got up into the nineties that day - the LitePads made it much easier to keep the news set inside the mobile studio nice and cool. 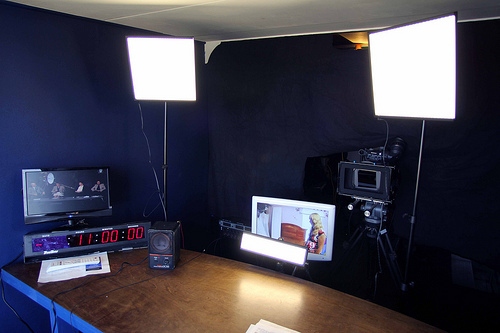 LitePad Axioms are a great choice lighting tight locations because they don’t generate heat and they don’t blind the talent. 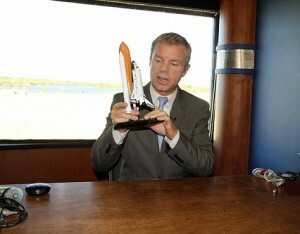 The mobile studio was a gigantic hit in the media area of the launch site. People from news outlets from around the world kept coming by to see “The Truck” and ask me questions about how to incorporate Rosco VIEW and LitePads into their studios back home. Meanwhile, Dave’s crew was out of the sun, air-conditioned and sheltered from the high winds we experienced that day - making the crew more comfortable, the anchors more presentable and everyone in general was in a much better mood - even though the launch was scrubbed. What better way to illustrate to you how well the Rosco VIEW and LitePads work than by showing you a video shot on-board the WFTV mobile studio? Dave Sirak at WFTV was kind enough to shoot some footage of me on their mobile news set, and we’ve added the video to our Rosco YouTube Channel. 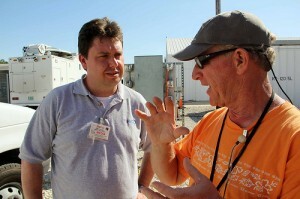 LitePads and Rosco VIEW help WFTV shoot their stories where the news happens - and they can do the same for you.